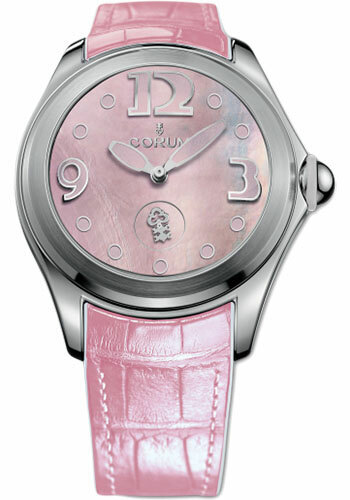 42 mm stainless steel case, 16.50 mm thick, sapphire back, domed sapphire crystal crystal with antireflective treatment, pink mother-of-pearl dial with pink superluminova, caliber CO 295 automatic movement with hours, minutes, and smal seconds, approximately 72 hour of power reserve, pink alligator leather strap with rubber lining, pin buckle. Water resistant to 100 m. (Old reference 295.100.20/0088 PN36). 42 mm stainless steel case, 16.50 mm thick, sapphire back, 5N 18K rose gold crown, 5N 18K rose gold bezel set with diamonds, domed sapphire crystal crystal with antireflective treatment, pink mother-of-pearl dial with pink superluminova, caliber CO 295 automatic movement with hours, minutes, and smal seconds, approximately 72 hour of power reserve, pink alligator leather strap with rubber lining, pin buckle. Water resistant to 100 m. (Old reference 295.100.29/0088 DN36).